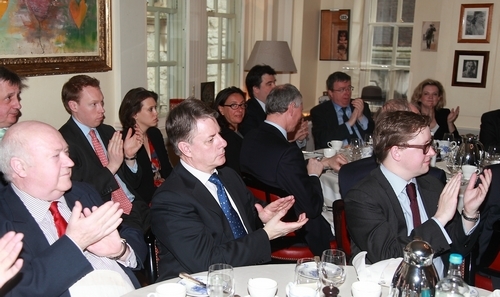 It is a real pleasure for me to join you at this Walbrook Breakfast. Lord Palumbo has invited me to brief you on the current state of China’s financial sector and the financial cooperation between China and the UK. This is a vast subject that could take many hours to review. But, as this is a breakfast meeting, I try to be brief and limit my thoughts to an overview. I believe we should evaluate the development of China’s financial sector from three aspects. The first aspect is financial institutions. This is also an area I want to highlight. At present financial institutions in China fall into three main categories. · They are the main players in the market and generally in good shape. · They are massive and rank high in global terms. · For example all China’s five major state-owned banks are Fortune 500. · The Industrial and Commercial Bank of China (ICBC) is the largest bank in the world by assets and by market capitalization. · In corporate management, they have all adopted modern corporate structure and gone public. · In profitability they are the envy of their colleagues in other countries. · For example, ICBC fetched a net profit of more than 230 billion RMB last year. That was an increase of 14.5% than previous year. · In asset risk the main financial indices of China’s banking sector are upbeat compared to the average international level. Though some indicators show a rise in bad loan ratio, the risk is till under control thanks to the high provision coverage of these banks. · Up to now they have all opened branches or subsidiaries in London. They are growing both in commercial size and business sector. The second category of financial institution are small and medium financial institutions. I believe you all understand that massive banks alone does not make a mature market. For example, arteries alone do not suffice to sustain a human body. We also need capillaries. In recent years China’s small and medium financial institutions have grown rapidly. Examples are the urban and rural commercial banks as well as guarantee firms. Their fast growth has enabled the market to offer bespoke, targeted and quality financial services. I draw your attention to statements made at the 18th Congress of the Communist Party of China late last year. For the first time it was stated that China needs to develop private financial institutions at a faster pace. This was a decision of great significance. It will further diversify and improve the makeup of China’s financial system. This will in turn encourage positive competition and make more efficient allocation of financial resources. In particular, with a growing number of outlets and geographical reach, HSBC has become the largest foreign bank in China. Standard Chartered led others in opening a village bank in China. Moreover, with deepening financial reform in China, interest rates will become more market-based. Consequently, the Chinese market will be more attractive and foreign banks will be able to better play their strengths. The second aspect of China’s financial sector I would like to discuss with you is the financial market. · Money, bonds, futures, insurance, foreign exchange and gold markets all made great advances. · At the end of 2012 the total market cap of companies listed in Shanghai and Shenzhen stock exchanges amounted to 22.7 trillion RMB. · The issue of bonds in various types totaled 8.6 trillion RMB. That was the third largest in the world. · Futures markets have also made steady progress. They now cover farm produce, metals, energy, chemical and financial products. · The insurance market also grew rapidly. · Insurance premiums mounted up to 1.55 trillion RMB. That was an increase of 8% than the previous year. On the whole China’s financial markets are getting more and more open. A telling example is investments in the bonds market by QFII had reached 80 billion US dollars. The relevant policies will become more liberal in the future in light of actual needs. The third aspect of China’s financial sector is the Chinese currency RMB. Obviously the RMB is at the heart of Chinese financial markets. It mainly involves two areas: the exchange rate of the RMB and internationalization of the RMB. Relatively speaking, the RMB exchange rate is no longer a major issue. This is because the RMB has gradually appreciated and two-way floating is allowed. This has happened since the introduction of RMB exchange rate reform in June 2010. With these measures, the RMB exchange rate has become noticeably more responsive and resilient. The market consensus believes that the RMB exchange rate is now close to equilibrium. In comparison internationalising the RMB has attracted a great deal of attention. · First, it should be a currency for trade settlement. · Second, it should be a currency for investment. · Third, it needs to become an international reserve currency. By these criteria, the RMB still has a long way to go. · China has signed currency swap agreements with more than 20 economies. · Their trade with China makes up for 30% of China’s total foreign trade. · Channels for making overseas RMB investment are being broadened. · One year ago the Chinese government started RQFII trials in Shenzhen and Shanghai. These commendable attempts have made it possible for RMB to flow back and hence will encourage greater use of RMB. · Over the past year the trials have been running smoothly and the authorities are preparing to enlarge the programme. · It is a leading global financial centre. · It is the world’s largest foreign exchange market. · It has special links with Hong Kong. · HSBC issued three-year RMB bonds in the London Stock Exchange. · According to the SWIFT figures, in recent months RMB business in the UK has exceeded the RMB use in Singapore and the United States, only next to Hong Kong. · Central banks of our two countries are planning to sign currency swap agreement. 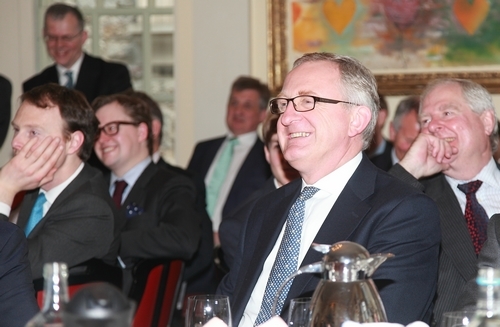 · HSBC has long been committed to London’s status as an offshore RMB centre. · HSBC even set up a research taskforce. · I personally have had in-depth discussions with Chairman Douglas Flint about this matter on many occasions. Overall I believe London as an offshore RMB centre is a win-win situation. But, we should work with patience. We should let matters run their own course. I believe it will come true when conditions are ripe. In summary, China’s financial sector is in good shape on the whole. More important the prospects are excellent. In the spirit of those words, I hope British financial institutions will seize the time. 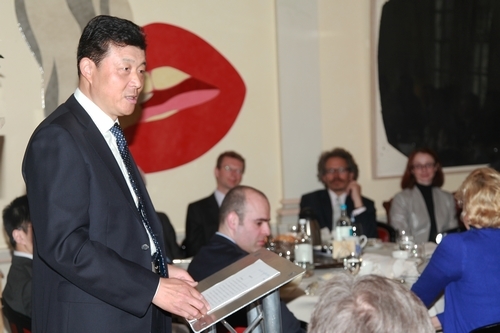 There are great opportunities for UK if it ‘swims with the tide’ of China’s financial sector. Now I am glad to take your questions.